In 1936 L.S. Chadwick shot a tremendous 51 inch stone sheep in northern British Columbia on an epic 60 day hunting trip with Roy Hargraves and Frank Golata. This ram went on to be scored as the world record and remains in the Boone and Crockett record book in first place. It’s iconic configuration is the logo of the Wild Sheep Foundation. The complete story of this hunt from personal diaries is being published in a new coffee table book called “Dream Rams of British Columbia” by Bill Pastorek. This book will be published in 2018 and contains over 500 photos and stories of legendary British Columbia wild sheep and wild sheep hunters. It also features extensive coverage detailing the story of L.S. Chadwick complete with never before seen personal notes and maps. This book is a treasure trove of information for any sheep hunter who has experienced BC. This sculpture and book set is a “must have” for any serious sheep nut. 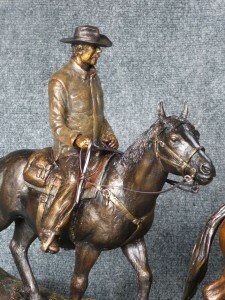 This bronze is 1/5 scale and stands about 16″ tall. 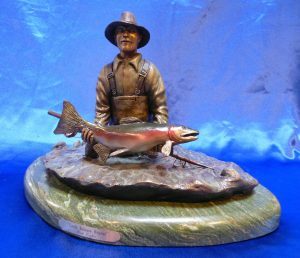 A purchase of this bronze will be accompanied by a complimentary copy of “Dream Rams of British Columbia” by Bill Pastorek. Retail $2450. USD includes shipping to continental US and Canada. Of all the dreams that fishermen have one of the top rated would be hooking and landing an elusive steelhead trout. These sea run rainbow trout return from the Pacific Ocean to their birthplaces hundreds of miles upstream dodging currents, physical barriers and predators. It is there that they spawn and, unlike salmon, do not die. Hence, they might return to the ocean for another cycle and live to return again. By living a portion of their lives in the ocean they can feed and attain a size and strength much greater than their freshwater counterparts. Their reputation as spectacular fighters is legendary and it is this characteristic that draws fisherman from all over the world to the Pacific Northwest. Wild steelhead are protected and revered and must be released. 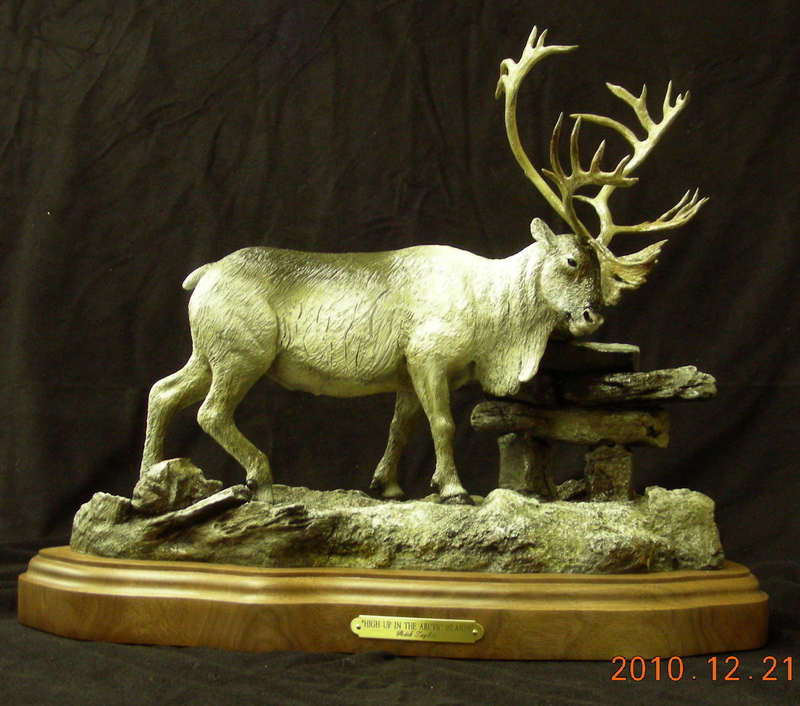 The overall height of this piece when mounted on a marble base is 10″ and it is 15″ wide. It is available with two different rod configurations as seen in the pictures above. The edition is limited to 48. $4500. US includes shipping to US and Canada. 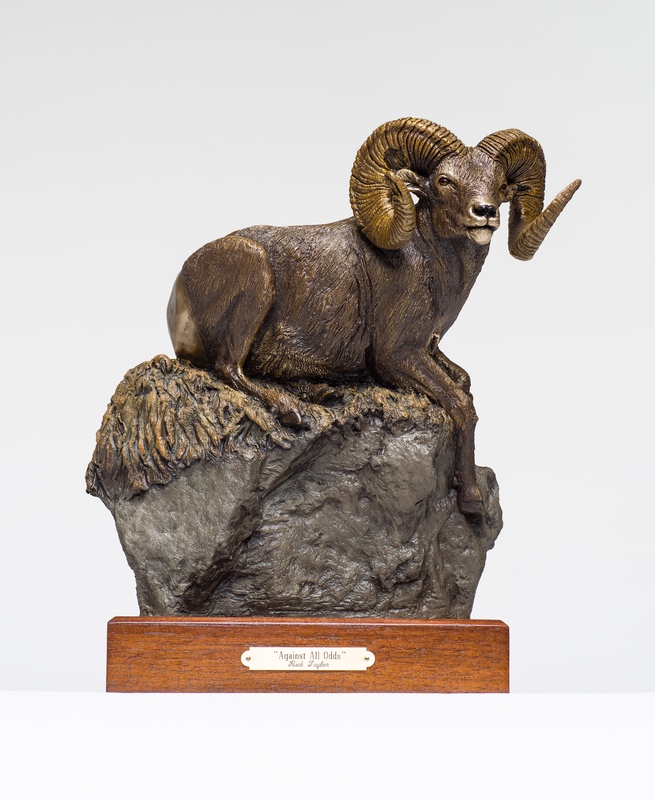 In the spring of 2015 the Boone and Crockett Club officially measured and recognized a new world record Rocky Mountain bighorn sheep. It was a ram that died in a vehicle collision southwest of Longview, Alberta. The life of this 12 year old ram was well documented by scientists at the Sheep River Provincial Park where the ram had been born and ear-tagged as a lamb. He was known as #706, and survived a life in an open hunting area with a massive wound to his right horn inflicted by poachers within the park boundaries in the winter of 2008. The growth of this ram’s horns was well documented by the researchers at the Miller Centre and after the near fatal head wound #706 left the area and spent most of his last two years in the foothills of the OH Ranch in the company of another ram. This story has been documented by Rick in a full color booklet with photos, maps, and information courtesy of Dr. Kathreen Ruckstuhl of the University of Calgary. This booklet fixes to the base of each bronze. 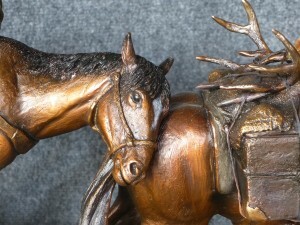 “Against All Odds” is a time limited edition and is 13″ tall by 11″ wide (in 1/5th scale) and is mounted on a walnut base. $2650. USD includes shipping in US and Canada. Taking a pack train of horses into the mountains for a hunting expedition should be on everyone’s bucket list. This extraordinary adventure is experienced every year in North America to access the highest and most remote areas. The return trip hopefully includes pack animals loaded with the trophies of the successful hunters. 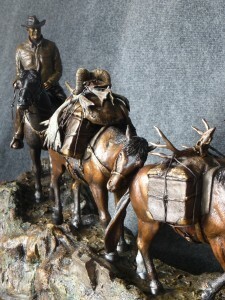 Here, the sculpture captures the pack train pausing and crossing a creek where they can drink and refresh themselves. This sculpture, which is over six feet long, can be customized to represent your memories. We can include your choice of trophies on the four pack animals and even customize them to look like particular animals if desired. With the guide leading the string, we can even customize the back rider to look like you! 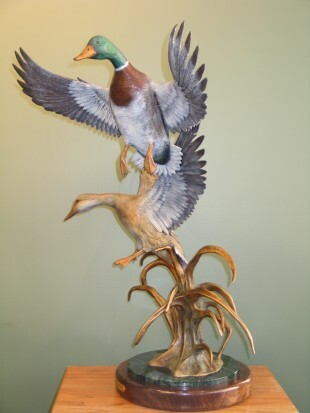 This sculpture tells the story of how and why you hunt. It commands a presence and views beautifully from all sides making it easy to place in the centre of a trophy room or lobby. “Down from the High Country” is mounted on a 2″ Black Walnut base and is approximately 72 inches long. $35000.00 USD includes crating and shipping in North America. Edition of 25. “Battle Scars” depicts a royal bull elk (wapiti) bugling his challenge. 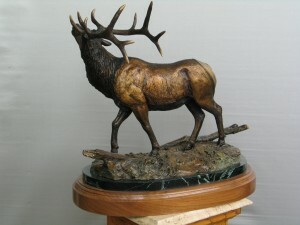 This piece is 17″ tall and is mounted on verdi marble and walnut wood. It is a limited edition of 48. $4800. US includes shipping in North America. 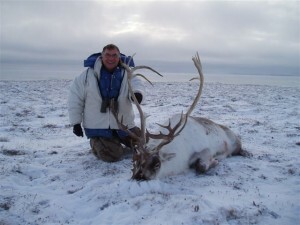 The artist in Nunavut with his world record Arctic Island Caribou in 2009. Marking many Arctic ridge tops are human made stone figures called “inukshuks”. They are way-finding symbols for native people and historically were used to drive caribou along certain routes. This caribou uses the inukshuk as a convenient scratching post. This is a photo of the clay model in progress. “High up in the Arctic” is a piece that is very personal to Rick. In 2009, on a hunt in Nunavut Territory, Canada, he was lucky enough to harvest a beautiful Arctic Island Caribou bull that officially scores 416 SCI points to become the new world record. At the 2010 SCI convention in Reno the rack was panel scored and beat the old record by 29 points. 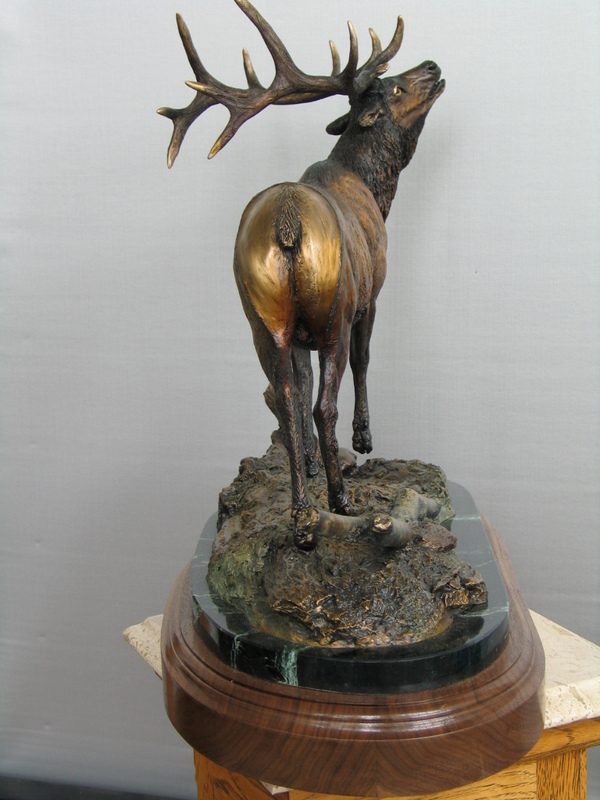 And to honor the event, the caribou bull depicted in the bronze “High up in the Arctic” bears a replica of the set of antlers of Rick’s new world record trophy. Each piece, in the limited edition bronze series, entitled “High up in the Arctic”, will unofficially be marked as one of forty-eight as befitting a new world record. It will also have an official foundry serial number. 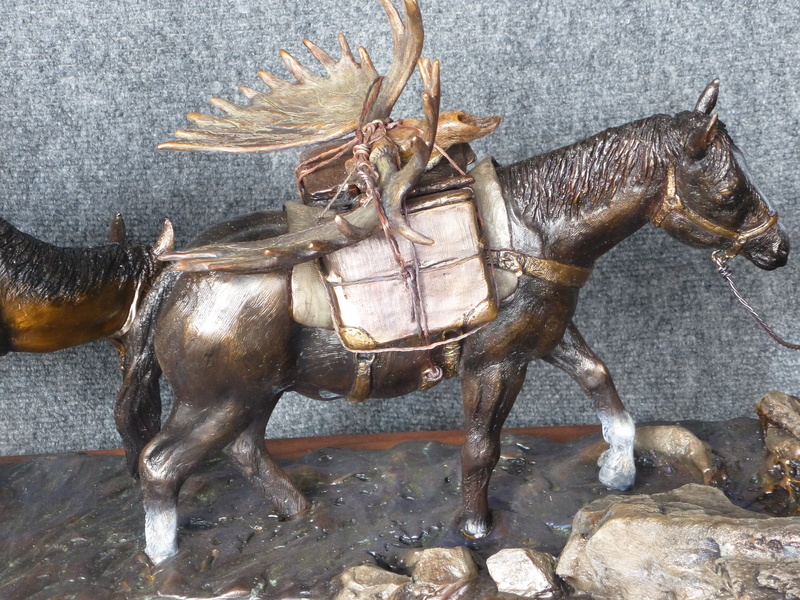 This sculpture is 18 inches long and 15″ tall. It is mounted on fine walnut wood. 4800 US includes shipping in US and Canada. The most widespread species of North American Waterfowl is the mallard duck. They are familiar to people from east to west. The sight of a beautiful greenhead drake and mottled hen descending on the cattails in the local pond is such a familiar sight that it elicits a response of home comfort. 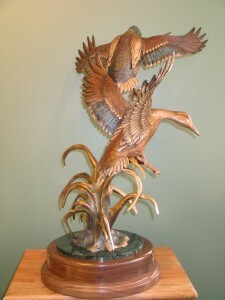 This limited edition bronze sculpture entitled “Home Waters” has an enhanced color patina to capture the electric marking of these ducks. This sculpture is 30″ tall. Edition is limited to 48. $6800. includes crating and shipping in the US and Canada. 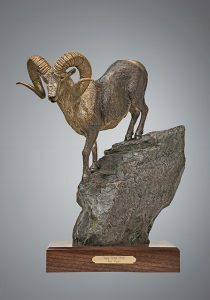 Limited Edition Bronze Sculpture “The Great One” depicts the legendary stone sheep called the Chadwick Ram. This famous ram is the largest of the Stone sheep species to ever be harvested. 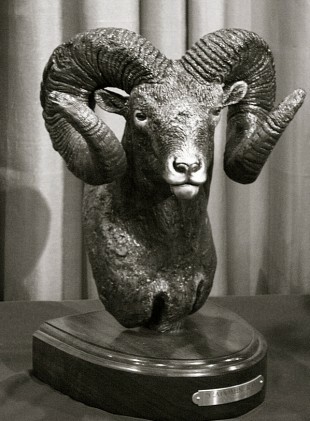 This ram was taken in 1936 by the famous L.S. Chadwick, and it’s status as world record has never been broken. This free standing sculpture can also be used as a bookend. 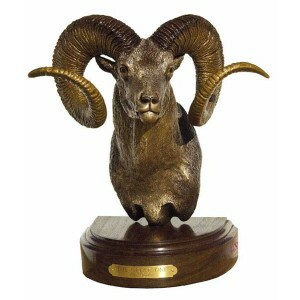 “The Great One” belongs to a series of four sculpture bookends all depicting currrent world record sheep. This sculpture stands about 11″ tall and is mounted on fine walnut wood. The edition is limited to 100. $1900 USD includes shipping in US and Canada. “Dall 2000″ is one of four free-standing sculptures depicting the four current wild sheep world records. This limited edition bronze sculpture can also be used as a bookend. 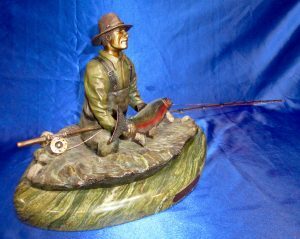 This sculpture has an enhanced color patina and is mounted on fine walnut wood. It is rendered in one quarter scale and stands about 12” tall. Edition is limited to 98. $1900 USD includes shipping to US and Canada. “Cadomin Ram” is a one quarter scale bust of the current world record Rocky Mountain Bighorn Sheep taken by Guinn Crousen at Cadomin, Alberta. These busts are designed to be bookends or stand-alone sculptures. 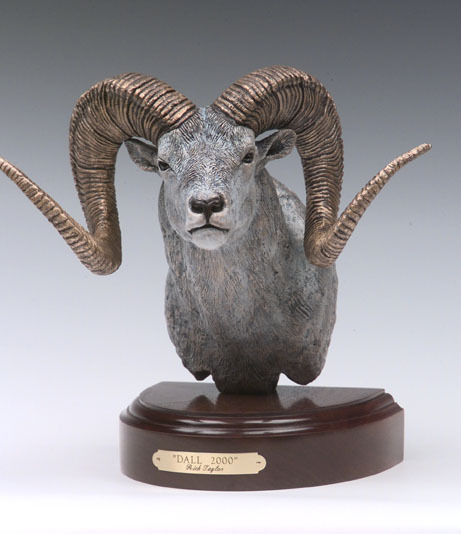 This limited edition bronze sculpture is part of a set of four which also includes “El Patron” (desert), “The Great One” (stone sheep), Dall 2000 (Dall Sheep). No one can reproduce the nuances and subtleties of a set of sheep horns as Rick can. His committment to rendering these specific animals accurately is unsurpassed in big game art. 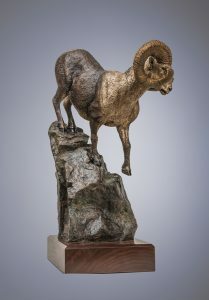 “Cadomin Ram” stands 12 tall and is an edition of 100. $1900 USD includes shipping in US and Canada.